NNeng performs video and audio live. Brian Moran, Nancy Meli Walker and Benton Bainbridge create realtime cinema in an intense and intuitive union of sight and sound. Improvised within preset parameters of props, rhythms and movements, every NNeng performance is unique. Bainbridge and Meli Walker focus cameras on found objects and custom creations, manipulating the video image with digital and analog FX devices. Moran spins subtly shifting soundscapes with classic analog synthesizers and sampled sound, echoing and influencing the montage in a tight feedback loop with the vidicians. NNeng produces the experience LIVE in an amalgamation of oscillations, geometrics and organics, an ultra-abstracted mindstate at 60 cycles per second. 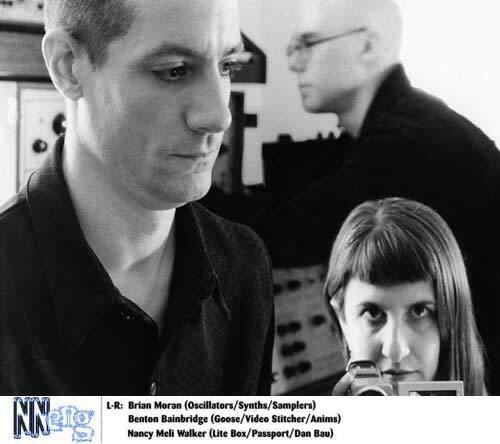 The trio first met in the summer of 1997 at Manhattan's Bar XVI and Moran immediately proposed a jam. That first 25 minute improv laid the foundation for their collaboration. Benton has been making cinema since 1983, focusing on Live Video since co-founding 77 Hz in 1991. Nancy walks down many avenues; sculpture, installation art, alternative photography, performance video projects and is currently studying the ancient metal tecnique of chasing and repousse. Musician and dancer Brian plays synths with Operating System Bug and curates +/-, an ongoing series featuring improvised dance and electronic music.